In October 2014 California legislated that all businesses generating more than 4 cubic yards of solid waste per week will have to recycle Organic Waste by 2019. The law is introduced incrementally from the 1st of April 2016. Many in the western world are accustomed to the concept of recycling now; we all know that empty plastic containers should not go in the general waste bins don't we? Despite plastics and cardboard recycling being generally well-accepted in many countries, the recycling of organic waste typically has not entered our collective consciousness like the recycling of cardboard and paper has. A study done in California in 2014 revealed that over 30% of all waste sent to landfills could be used to create compost or mulch this is important because Greenhouse gas (GHG) emissions resulting from the decomposition of organic wastes in landfills have been identified as a significant source of emissions contributing to global climate change. 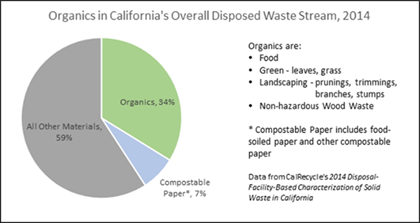 After much study, In October 2014 Governor Brown signed AB 1826 Chesbro (Chapter 727, Statutes of 2014), requiring businesses to recycle their organic waste on and after April 1, 2016, depending on the amount of waste they generate per week. Despite California's robust recycling infrastructure for traditional recyclables, the state continues to landfill organic materials at an alarming rate. In fact, food is the most prevalent item in the disposed waste stream and over 40% of all material going to landfills is readily compostable or anaerobically digestible. This is simply unacceptable, and it is irresponsible of us to waste this valuable material. This law also requires that on and after January 1, 2016, local jurisdictions across the state implement an organic waste recycling program to divert organic waste generated by businesses, including multifamily residential dwellings that consisting of five or more units. This law phases in over a two and a half year period and may result in businesses even generating as little as 2cubic yards a week being required to implement organics recycling if the statewide disposal of organic waste in 2020 has not been reduced by 50 percent of the level of disposal during 2014.